Does it feel like I’ve been working this Inuit cultural centre project for eons? It was really a huge endeavour. We kicked it off in June 2016 and my role wrapped up in October 2018 when the final text panels were signed off. Unfortunately, I can’t show it to you yet because the centre hasn’t had its official opening. But I’ve seen photos and the place is just gorgeous. It’s the most beautiful gallery I’ve ever been involved with. “By Labrador Inuit, for Labrador Inuit, about Labrador Inuit”—and to ensure that the material represented Inuit as a vibrant living culture. How to handle the “about” was easy enough–we were to tell the Labrador Inuit story. The “for”message was driven home during our first community meeting when I asked the question: How much of the content should be explanatory for non-Inuit visitors? Answer: None. But the “by Labrador Inuit” was going to prove tricky, at least from a writing perspective. Yes, we had lots of beautiful Inuit art, crafts, photos, personal items, and archaeological material. But the words. What about those? The very last thing this cultural centre needed was me trying to tell Inuit stories. No. I needed Inuit voices. So my writing work turned to curation. To do this right, I had to find and select words spoken or written by Labrador Inuit that best represented the messages we were trying to convey. And this took me into the most immersive research I have ever done for any project. It started by reading everything I could get my hands on. The people we worked with at the Nunatsiavut Government (NG) shipped me a box of books, magazines, transcripts from oral histories, and other material. I also amassed my own library — first, books on the craft of writing this kind of material, then books by and about Labrador Inuit. 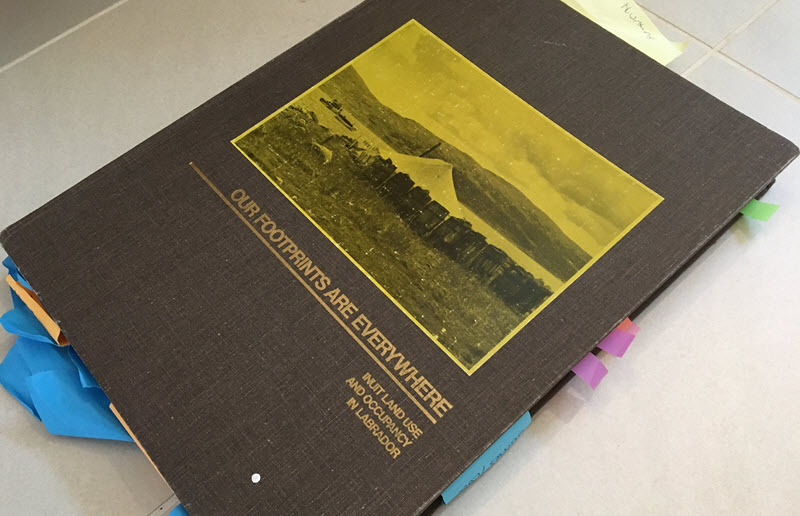 These included Our Footprints Are Everywhere, the 350 pages of documentation that resulted in the successful Labrador Inuit Land Claim; the Inuit chapter of the Truth and Reconciliation Commission Report; The Royal Commission Report on Aboriginal Peoples; and over 100 back issues of the Labrador oral history magazine, Them Days. Plus lots more, all of which I read thoroughly and flagged copiously. I also watched recent and archival interviews and statements by residential school survivors, Spanish flu survivors, and elders sharing memories of their lives before relocation and how they are affected by climate change. For these, and other video accounts, I typed out key portions of the transcripts from which I’d draw material when we got to those sections of the exhibit. And in between all this, NG was arranging phone conferences for us with Inuit experts on everything from language and music to sled dogs and land claims. On every call, I took detailed notes so I had quotes to work from. 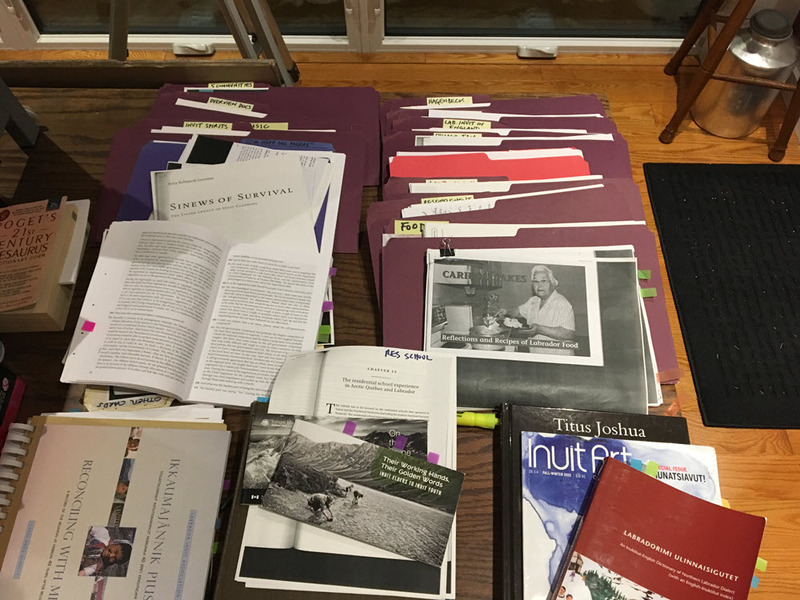 That work gave us the material we needed to depict Labrador Inuit tradition and history within living memory. But it left us with two gaping holes — long history (the previous 3000+ years) and contemporary voices talking about today and tomorrow. For contemporary voices we did two things. NG gathered what they could from their end. They put calls out to the communities and to specific people for comments about various topics. They also sent staff to various community events to solicit comments, opinions, and ideas related to those events. Meanwhile, I started trawling Facebook and Twitter — where better to gather the voices of young people and folks just talking about day-to-day life in Nunatsiavut? I gathered three or four dozen posts and sent them to NG with notations as to where I thought we could use them. NG went through the list, picked the ones they wanted, reached out to their own social media channels for more, and then got permissions from the people whose posts we wanted to use. It worked beautifully and we ended up with a rich collection of quotes and photos representing Labrador Inuit life today. The final piece of the exhibit was the archaeological section — the long history. For this, of course we had no Inuit voices to bring us the news from that time. This was a section I needed to write. And to do that, I needed to work directly with the archaeologists. Early in the project they had provided us with two- to three-page backgrounders on all the different Indigenous Peoples who had inhabited Labrador over the previous 3000+ years. I had read those so was somewhat familiar with the material, but now we needed to tell those stories using just artifacts as our guide. So I had the archaeologists provide me short paragraphs on each artifact telling how it illustrated the lives of the people who used it. What is it? Where did it come from? Who used it? And what did they use it for? How we heated our homes started to shift in the 19th century…. But as we worked our way back in time, I had to abandon that approach. The earliest Labrador inhabitants were not ancestors of Labrador Inuit. So for the final sections I wrote the artifact descriptions in more traditional archaeological style. In the end, it would have been ideal if the cultural centre had its own writer– someone from the community. But there wasn’t anyone, so NG entrusted me with that work. Therefore, it’s important to understand that everything I wrote or selected was reviewed by NG and by the person who spoke or wrote those words, or their family if the person was deceased. Everything was also reviewed by the Inuktitut translators to ensure the “Inuit voice” felt true. Wow, this is a fascinating inside view of what goes on behind the scenes for museum curation. I was particularly impressed by all the research you did, as I have a lot,of that ahead of my myself…..